Spotify may be losing $200 million a year, but QQ Music, China’s version of the global music streaming service, appears to be turning a profit. At least that’s what Wu Weilin, general manager of the music division for QQ Music’s parent company Tencent, said at a recent industry forum, according to Chinese reports cited by Mashable. How is QQ Music succeeding where Spotify struggles? For one, Tencent. In addition to the music streaming service, the tech and e-commerce giant also oversees a social network, a gaming platform, and the hugely popular WeChat messaging app, which has more than 700 million active users. The company’s massive reach into the Chinese population means it has solid negotiating power with record labels, which likely helps it secure advantageous licensing agreements. 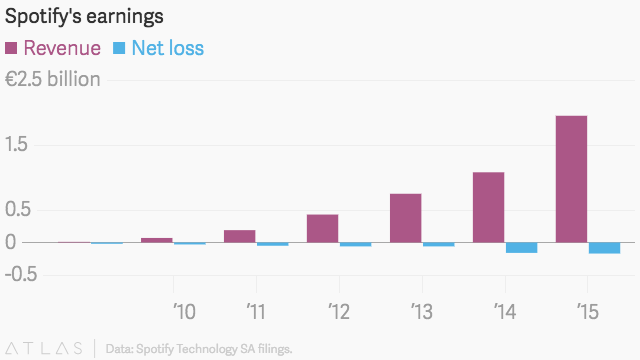 (For music streaming companies, royalties paid to songwriters and labels are usually the biggest drain on revenue.) Thanks to Tencent’s size, QQ Music also has a colossal user base: 400 million monthly active users, compared to Spotify’s 100 million. Other music streaming platforms are eyeing this 360-degree approach—Pandora has started selling concert tickets and Apple Music is keen to add video offerings—but they could certainly stand to do more of it. The question is whether consumers are willing to foot the bill.